This pdf clocks in at 11 pages, 1 page front cover, 1 page SRD, 0.5 pages of editorial, leaving us with 9.5 pages of content, so let’s take a look! This being an adventure set-piece/location-supplement/encounter-collection, the following will have SPOILERS. Potential players should jump to the conclusion. So what is Pakuvresh? The simple response would be that it is what happens when a truly vile wizard has too much time on his hands – the location is basically an autonomous plant that cranks out horrid monstrosities and awaits its creator’s return to unleash its dread armies…or so the story goes. Situated in the astral plane, the place is certainly not one that novice adventurers will want to visit. Anyways, the pdf then goes on to provide a series of linked encounters: We begin with bone devils harvesting flesh via their “recruitment” in a wasted village, with the devils bearing a new item, shadowstones, which allow for easy travel to Pakuvresh’s gates. 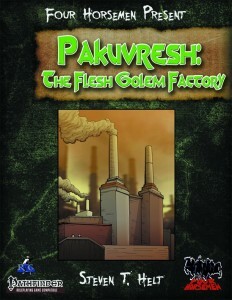 The gates of the factory on the plane of shadows are guarded – you guessed it – by flesh golems…and an animated lock. Nice to see that one feature herein. Beyond the adamantine-banded doors, strange machinery tries to dissect magical creatures to generate prototype plane-shifting golems, something the mad sole survivor, a one-legged gnome named Glimix, tries hard to prevent – though his delusions don’t help him there. Editing and formatting are top-notch, I noticed no significant glitches. Layout adheres to Rogue Genius Games’ two-column full-color standard for the series and the pdf comes fully bookmarked for your convenience. The pdf sports nice full-color artwork, some of which you may know from other supplements. Steven T. Helt’s prose is impeccable – Pakuvresh is an awesome location and drips the gory fear of an automated slaughterhouse and combines it with body horror par excellence – prose-wise, there is not much to complain. At the same time, this supplement left me somewhat unsatisfied – for one, while I enjoyed the respective encounters, I did feel like the place is more opaque than it really should be – the lack of a map hurts this pdf quite a bit. There is a more important component here that’s a bit amiss, one perhaps tied to the lack of a map, though I’m not 100% sure: This is this huge, magical slaughterhouse that makes monsters from killed people, right? So where are the conveyor belts? The automated hooks? The sudden saw blades ? The blood drains? The chutes? The “Evil Within”-cut-everything-to-pieces-madness? When I picture a place like this, I see lethal terrain galore – monsters, yes, but also a location that’s as much the enemy as any of its caretakers. The encounters, perhaps due to a lack of a map, are suspiciously bereft of interesting terrain features to utilize in combat. You won’t find complex hazards or the like herein, which, ultimately, made Pakuvresh less of a threat and more creepy window-dressing for a series of good encounters. So yeah, I was pretty much disappointed by this one, as loathe as I am to say it. The excellent prose and glorious concept quite frankly would have deserved a better, deserved the one step beyond this does not go. My final verdict will hence clock in at 3.5 stars, rounded down for the purpose of this platform. You can get this encounter-collection/locale here on OBS and here on d20pfsrd.com’s shop!